I was never very good at physics, in fact I was shocking (no pun intended). Even if I memorised the rhymes till I turned blue in the face, when it came down to a test or making something work I didn't know my positives from my negatives and failed every time. On the other hand, when it came to chemistry I was "Queen of the Lab", I loved the way things worked and how 1+1 did not always =2. Unfortunately at my school we just had "science" as a subject and so, although my chemistry scores were FANTASTIC, my physics scores were so flat I had to drop "science" as a subject. I had to find another subject, still in the "sciences" faculty which would let me continue my love for chemistry without having to face those dreaded physics lessons ever again. I chose "home economics" and I guess that is where my love for cooking began. I saw the chemistry in it straight away, so while for many of my classmates it was just a "science" subject to add onto their qualification at the end of their high school career, for me it was just like being in a lab, different tools, different chemicals but still reactions that created something beyond what you would have imagined when everything started. In those 1 and 3/4 years that I was in Mrs Roy's class I had flops and successes, learned how to make choux pastry and that souffles were not as scary as pop culture made them out to be. 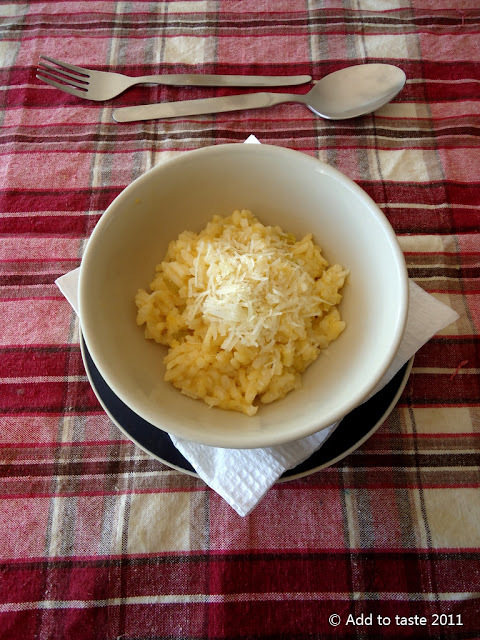 This was the first time I had made risotto. One of the most incredible reactions in the kitchen. Without an ounce of dairy, one of the creamiest dishes in creation forms right in front of you and the flavour options...endless. However, that was also the last time I had the chance to do that experiment, not for lack of trying. Sad but true. If you were not able to take a home economics class in high school, but would love to learn to cook, you may want to find out more information on online cooking schools. 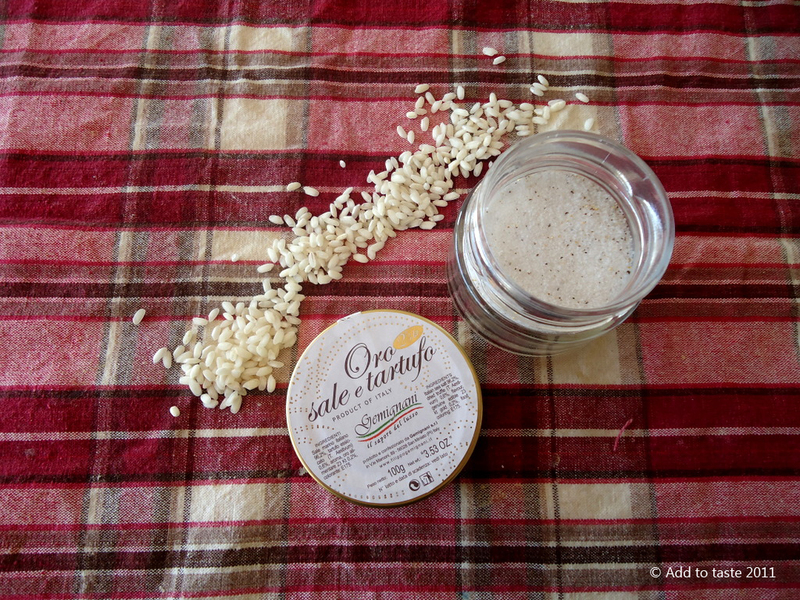 A long while back @SagraFoods gave me a beautiful jar of gold flecked truffle salt. I was ready to use it the minute it was delivered, but living at my mom's house, I had to wait...patiently. It wasn't easy. Every time I opened the store cupboard, the rich, earthy aroma of the truffle salt tickled my nose, drawing me closer. I had to resist until my very own lab...kitchen...was ready. As promised though, the first people to try a dish with this salt would be my family. I looked for a recipe that would really make the salt shine, but still had some skill involved and it dawned on me, risotto would be the perfect platform for just that. Ready to go I told my family exactly what they were having for dinner and I was so excited, until the very day the magic was meant to happen, when I realised I hadn't made this dish in 10 years. Excitement turned to nerves and I lost my confidence, I even admitted to @polkadotcupcake how scared I was. Even so, I went ahead and I didn't regret it for a moment. Their were no fireworks, explosions or fizzing and popping, just the slow, steady, rich, alchemy that I remembered from my schooldays. Optional: Most recipes include a glass of white wine. My mother really doesn't like food cooked with wine so I omitted it. Heat up the stock and keep it warm. Put the garlic in with the stock. In the meantime heat up oil and butter and fry up the onion and celery until translucent. 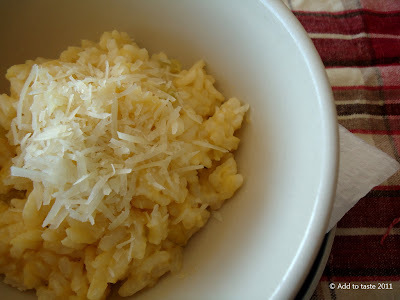 Add the rice and make sure it is well coated with the oil butter mixture and let it cook for a few seconds (at this point if you are using it, add the wine and cook until the rice absorbs it). At this point start adding the stock, 1 cup at a time into the rice, stirring gently until each cup is absorbed (if you find that you are running out of stock before you rice is ready, add a bit more boiling water to the stock). When the rice is ready (should be soft and creamy but not mushy) add the lemon zest and stir until well incorporated. Take off the heat and add the truffle salt, stirring well. Season to taste. Serve with the Parmesan on the table.